Well known as one of Asia’s talented international female artist, Van Duong Thanh grew up in Hanoi and studied for twelve years at l’Ecole de Beaux Arts, Indochine and at the Academy of Fine Arts. She researched at the Institute of Culture in Hanoi from 1981 to 1987. She now divides her time between Sweden, where she teaches art, and Hanoi. Van Duong Thanh’s works were added by the Vietnamese National Museum of Art to its collection for the first time when she was 20. Since then, many of her exquisite artworks are on permanent display in National Museum of Art in several countries including Vietnam, Thailand, Singapore, Hong Kong, Spain, and Sweden. 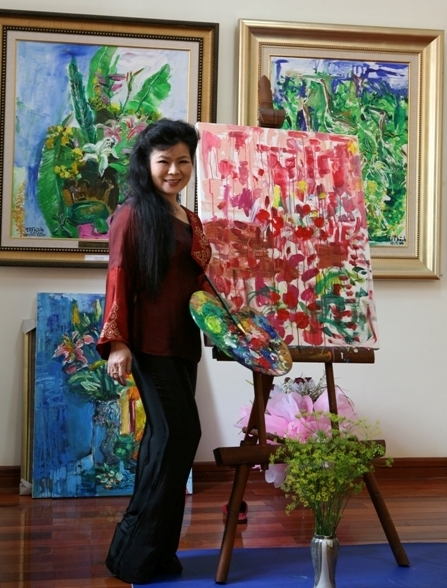 Being distinctive for a subtle combination of Asian and European heritage in which Western technique leans towards traditional motif of natural world, women, children and flowers through more than 1,600 paintings, Van Duong Thanh successfully inspires a large number of both domestic and international art lovers. The harmonious composition of vibrant colors distribution, reflection of its emotional value and touches of expressive semi-abstraction makes her paintings apparently unique in recognition. Van Duong Thanh received, among other awards, the highly regarded “International Excellence of Art of CFMI”, USA – France 1995 and 1997, and “Glory of the Nation” 2007..